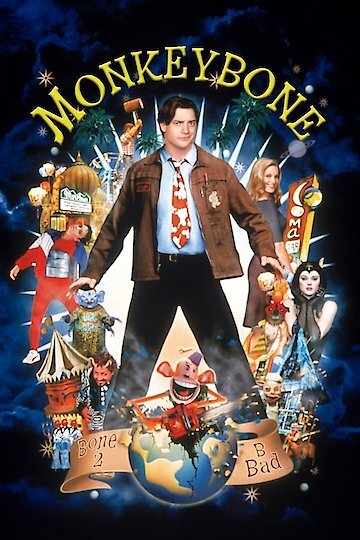 "If It Yells, If It Swings, It's Got To Be Monkeybone!" A cartoonist by the name of Stu (Branden Fraser) is disillusioned. He designs a comic strip that involves a rascally monkey. Stu finds himself in love with a doctor who is an institute worker. Her name is Julie McElroy. She attempts to help him with his nightmares by redesigning how he draws. During one of his nightmares, Stu will crash his car into a ventilator tube that causes him to enter into a coma. He enters into a coma when an inflatable monkeybone toy activates. Stu’s spirit is going to enter into Down Town, which is much like a spirit limbo world that looks like a carnival. In the carnival world, mythical creatures, figments of imagination and human beings are found. Stu is going to come across a friend who is known as Miss Kitty. She is going to help him along with way. Back in reality, Kimmy is considering the idea of pulling the plug on her brother. Stu starts to figure this out and asks how he can get out of the coma. Stu will go to the God of Sleep, Hypno, to ask how he can escape. Hypno tells him that in order to get out, he must obtain an exit pass. Back in Down Town, the crowd will cheer Stu and Monkeybone on. The rides will come to a stop and people will leave when they see the giant robot coming towards them. The robot will be known as Death. Monkeybone is going to tell the robot that he needs to use the bathroom. This causes the monkeybone to be placed back inside of Stu that leads him to wake up. Stu is told that he is being returned to normal so that he can continue on with his comic strip since Death likes it so much. When Stu wakes up to see Julie, he proposes and they will get married. Monkeybone is currently available to watch and stream, buy on demand at Amazon, Vudu, Google Play, FandangoNow, iTunes, YouTube VOD online.